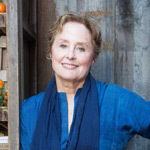 When they hear the term green chef, many culinary-conscious people instantly think of Alice Waters. Little wonder. This iconic chef, restaurateur, author, and activist has dedicated her life to advocating for an environmentally sustainable food economy that is healthful, delicious, and accessible for all. In a world of genetic modification, ecologically harmful farming practices, nutritionally bankrupt convenience foods, and inner city “food deserts,” Alice provides hope. A remarkable culinary pioneer, Alice has created a profound template for our future—and the future of our children. It can be found at the Edible Schoolyard, a place where students of all ages aren’t just taught about growing healthy and sustainable crops, they actually plant, raise, and harvest them right on their school grounds. With such a program in cities across the United States, public school students will graduate into the world with firsthand knowledge of sustainable agriculture—and what it means to share tasty, nutritious meals at the table with friends and family. The Edible Schoolyard program has become Alice’s top priority in a life filled with many amazing accomplishments. Her restaurant, Chez Panisse, is legendary for having set the standard for California Cuisine. It is so renowned that President Bill Clinton, when he was in office, once dropped by for dinner with a large contingent of Secret Service agents. But Chez Panisse is only part of a larger mission. Through numerous television appearances, articles, and books, as well as in her capacity as an international governor of the Slow Food movement, Alice has been at the forefront of efforts to bring the world back to a table at which completely natural, locally grown ingredients are served.